Next day, we left for Udaipur, the city of lakes. As we reached there, the splendor of royal era grabbed our attention. The rolling hills, beautiful lakes and white marble palaces give Udaipur a special appeal. We came across the spectacular monument-City Palace. Depicting the history of the city with honor, the palace boasts of its marvelous architecture. Lies in the centre of Pichola Lake, Lake Palace is another beautiful monument of Udaipur. Jag Niwas and Jag Mandir are also lying nearby. We also came across some old monuments like Bagore ki Haveli and Maharana Pratap Memorial.These buildings still showcase the local culture and tradition. The exquisite glass and mirror work done on the interiors is amazing. On our afternoon trip, we explored the Monsoon Palace. It rewarded us with amazing views of the lakes and hills. In the evening, we witnessed the Rajasthani folk dance and music that made us drawn deep in its authenticity. The day started with Pushkar visit. Though it is a small city yet is has its own charm and appeal. 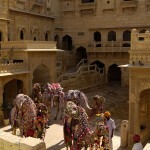 This city offers a more serene escapade to visitors as compared to any other tourist destination in Rajasthan. 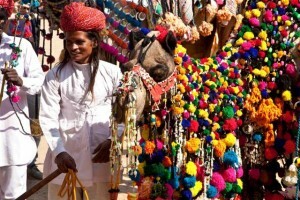 We got to know the famous Pushkar festival, when we visited the Pushkar Lake. It is said that huge livestock like cows, goats and sheep are sold in the fair. Neha insisted us to visit Brahma Temple; we both agreed and moved ahead. Counted among the most significant Brahma temples, it has the shrine of presiding deity of Lord Brahma. Built in the 14th century AD, this temple is dedicated to Lord Brahma. Thinking of our next destination, we landed in the dream world. Next day, we headed to Jaipur, the Pink City of India. 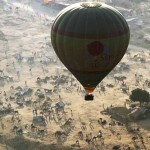 It is the largest city of Rajasthan. It houses some magnificent forts and palaces which add to the place. Started from City Palace about which we had already heard a lot, we moved ahead inside the palace. 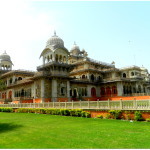 Standing apart with its exemplary architecture, the palace complex covers a huge area. As we started walking ahead, we come across a series of gardens, buildings and courtyards. Located near the boundary of the city palace, Hawa Mahal (Palace of Winds) is a worth visiting place. Khusboo was so excited to see this place that she could not help herself clicking some photographs. Named after Palace of Winds, this mahal boasts of its more than 950 huge windows. It was especially built in such a way to allow the royal women the views of the market areas. Nahargarh Fort was another fort, which became a part of our exploration. Located on the aravali hills ridge, the fort was built by Jai Singh. This magnificent fort presents an enticing sight at night. The most memorable thing of our Jaipur visit was Chokhi Dhani where we spend some time exploring the beauty of the place. Capturing the spirit of desert land, it ensures a perfect traditional Rajasthani experience. We enjoyed our food at this village resort. We relished authentic Rajasthani Food, which obviously had a lot of calories. Even I am very particular about my food though I could not help myself from enjoying the food with much ghee. In the evening, there were some cultural programmes, which filled our heart with fun and enjoyment. The traditional performances and the puppet show just took away my heart. With delightful memories, we left back for Delhi.